MICHELLE WEINBERG creates worlds. Worlds that exist on an alternate two-dimensional plane, but at the same time seem familiar, desirable, exciting. They are worlds where diving into hypnotic colour, fictitious architectures, purposeful pattern and elastic geometry seems not just possible but necessary in order to fully absorb what these new dimensions mean to their creator. 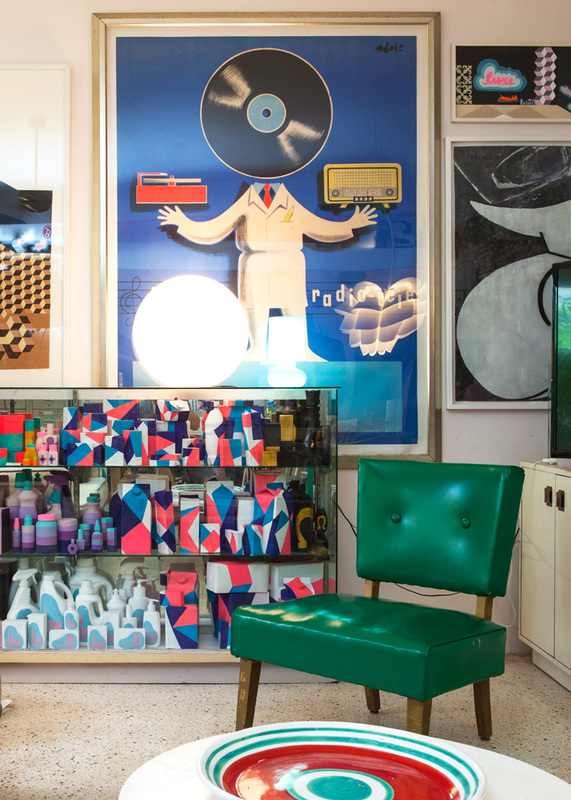 In our interview with the Miami-based artist, we find out what makes this incredible artist tick, and discover that Michelle Weinberg is inspired by almost every inanimate colourful object known to humankind, considers it a privilege that she is able to put beauty out into a world that isn’t always so, and wouldn’t mind creating her own décor and design empire. 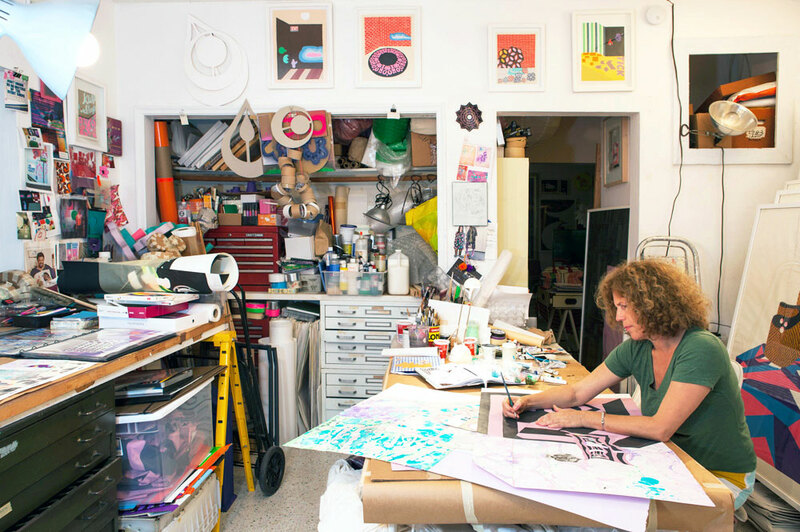 We met with her in her Miami studio where the vibrancy and colour of her city are clearly reflected. 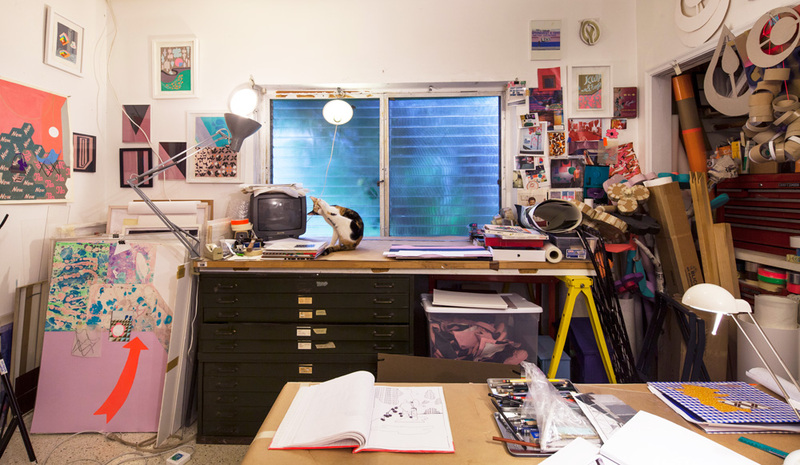 Photographer Paul Stoppi captured the artist in her space. Where do you live? What is your favourite thing to do in your city? Miami Beach, Florida, USA. My favourite thing is to swim in the ocean, eat a delicious breakfast, and then head into the studio to work. The thing I love about my Miami Beach space is that it’s right on the water, on the bay, and there are leafy plants with giant palm fronds and hibiscus flowers right outside my door. It’s that combo of urban and tropical that Miami is known for. Many many things – architecture, fashion, graphic design, typography, textures, patterns, set design, calligraphy, needlework, ceramics, comics and cartoons, folkloric crafts, markets, window displays, street signs, trash flattened on the ground, and sometimes even art! Here in Miami it’s a car culture, and I miss the inspiration that comes from walking everywhere, so I head to a strip mall that has three or four gigantic thrift shops. 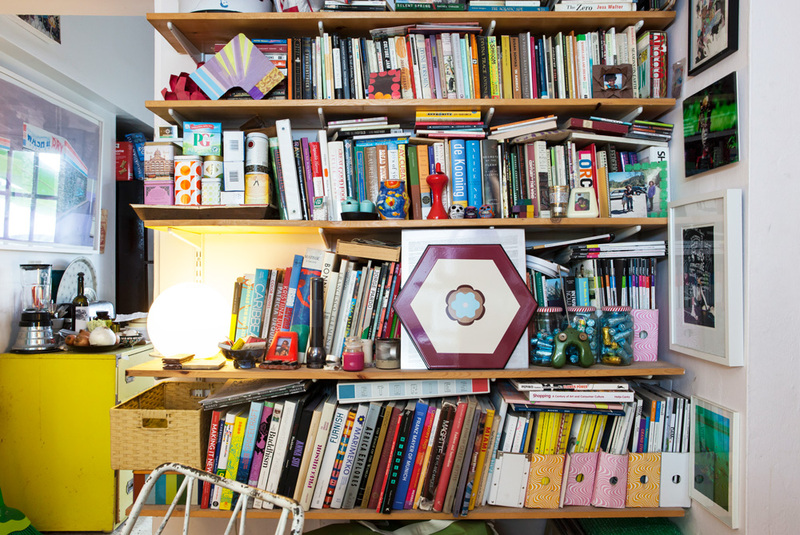 It’s an anthropological expedition, a massive jumble of colour, texture, pattern, and I research and re-charge there. 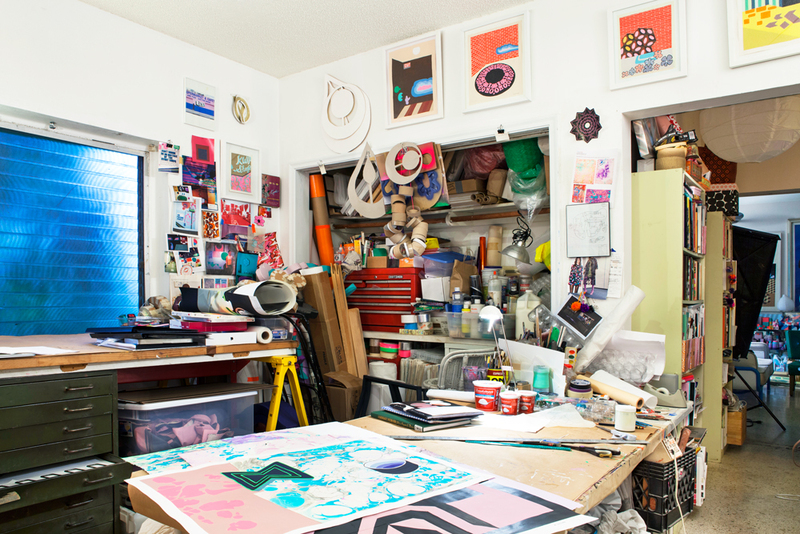 Michelle’s studio is organised chaos, with a constant supply of materials. In the foreground is Rabbit Hole, available in our online gallery. Tools of her trade, and keeping things in order. 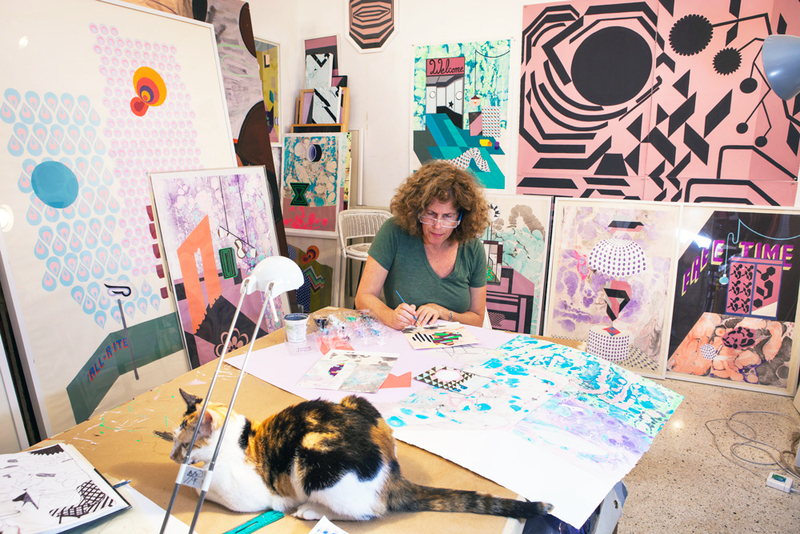 Michelle works solo in her studio, except for her feline friend, Daisy. Being an artist allows me to prioritise making lovely aesthetic decisions over the course of a day. It is a luxury, a great privilege, when life can be full of suffering. I am grateful for the opportunity to do my work on that sublime, sheltered fringe of human possibility, contributing in some small way to the health and expression of beauty and the human spirit. An artist must be inventive endlessly. In my art and in my life, I am fully responsible for all the motion that happens. Nothing is pre-fabricated. I hope people feel transported to my virtual world, and that they are stimulated, delighted, that strange new thoughts are provoked, and that they feel even a tinge of joy. Coffee or tea – I go both ways – and reading…. A slow start to the day is best for me. That being said, I’ve been keeping up with 7am yoga for quite a while now. Not the easiest on my natural body clock, but it feels good! I’m an avid reader, both fiction and non-fiction. I’ve always got multiple books underway in book form, on Kindle app, reference books about art or technology folded open on various worktables and counters, plus a regular flurry of magazines. Michelle is an avid reader and advises young artists that learning to write is instrumental to an artist’s success. Michelle holds Rabbit Hole, available in our online gallery. An inspiration wall like no other, Michelle draws colour and pattern inspiration from a variety of sources. I describe my work as personalised geometry. Shapes, planes and spaces divided up and coated with colour. Definitely. Since I was a kid, nothing was more amazing than art – or music, dance, theatre – which I experimented in. But visual art always won out because I could do it totally on my own at any time, any location, any age, with any materials, and I could be completely in charge of that expression. I am grateful for the opportunity to do my work on that sublime, sheltered fringe of human possibility, contributing in some small way to the health and expression of beauty and the human spirit. As a child, seeing the extraordinary Persian miniature paintings at the Metropolitan Museum of Art in NY. Each time I got into that Near East Asian collection, I sat at the chairs provided and pored over those incredible paintings of stacked and patterned spaces arranged in glass cases. I’ve done many jobs, mostly all art-related, that have enriched my life and my work. The engine of having to earn a living has enabled me to cultivate new skills and interact with amazing people. Teaching art is a huge pleasure – sharing what I love best. Creating and facilitating opportunities for other artists runs a close second. Writing about art and assisting non-profit organisations to make art more accessible to the public is also rewarding. I’ve been lucky to avoid serving food or cleaning up after people! 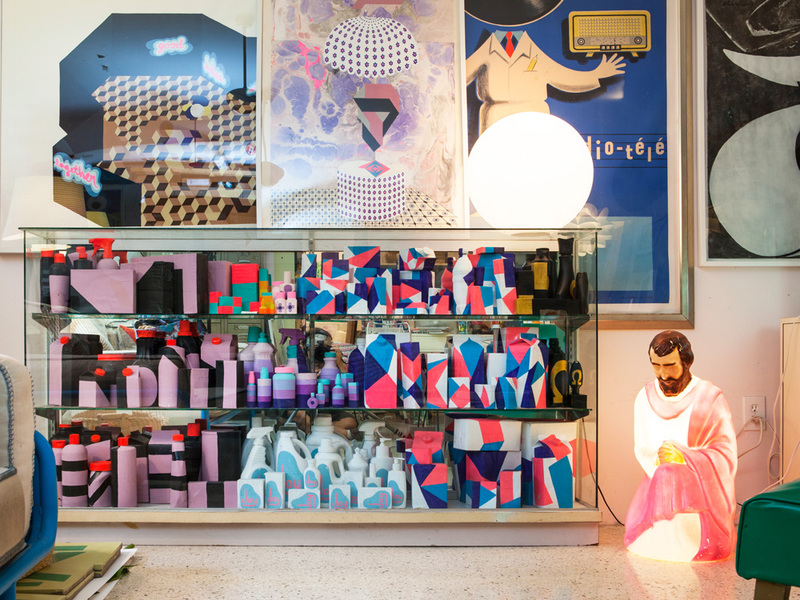 Michelle’s studio shelves contain pieces from Souvenir Shop (2013) – an ongoing project of upcycling containers and packages by removing the original advertising logos and replacing with colour and pattern relationships in papier maché and paint. Resting above centre is Modern Diagram, available in our gallery store. 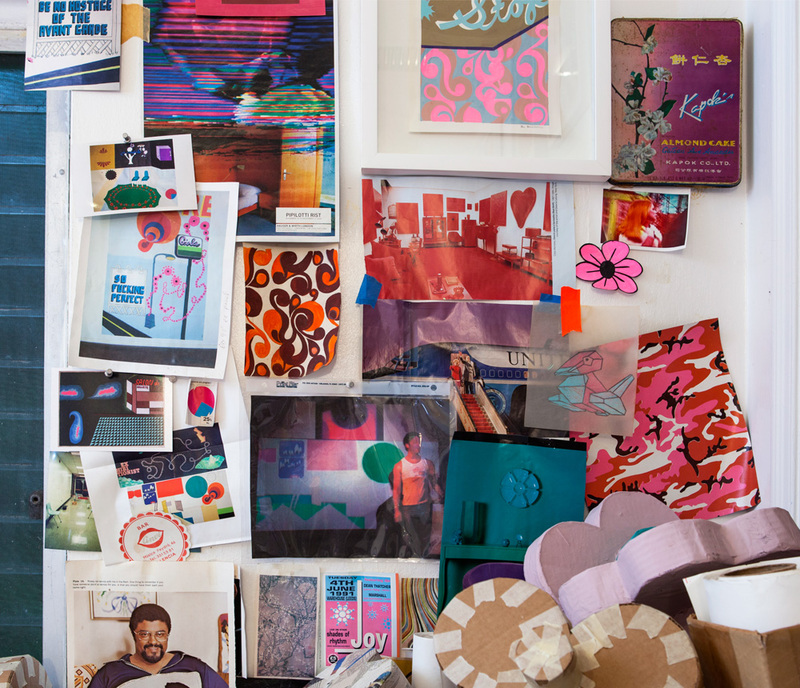 Michelle’s use of colour and pattern is influenced by the vibrancy of her home town of Miami. Hand-marbled paper features heavily in Michelle’s work and the images have been made into rugs and wallpaper. Lucy the dog inspects the work. Too many to name, but I’m a huge fan of many female singers and female-fronted bands – Joni Mitchell and Laura Nyro are the giants, but others are: Joan as Police Woman, Jenny Wilson, TuneYards, Alice Russell, Aimee Mann, Marisa Monte, Los Aterciopelados, Marilyn McCoo, Sia, Buika, Camille, Cassandra Wilson, Tys Tys, Susana Baca, Janelle Monae, Stereolab, Miriam Makeba, the list goes on and on…! This is truly corny, but in fifth grade one of my favourite teachers wrote to me: On the road of life, remember to do good and never mind to whom. That seems today still to be the single best piece of advice I’ve been given, and I try to live up to it. Learn how to write – most important thing after your work in the studio. I believe having some confidence to express yourself in writing is crucial to any artist. Unless you can afford someone else to do it for you! To be able to identify what your interests are, write statements, propose projects, ask for money. It’s invaluable to be able to write. I have a few dream projects. Design and build my own live/work space would have to be the first. But perhaps at the same time I can create the art and decor for a restaurant, bar or cafe – murals, textiles, furniture, lighting, signage, serving platters and dishes, the whole thing! 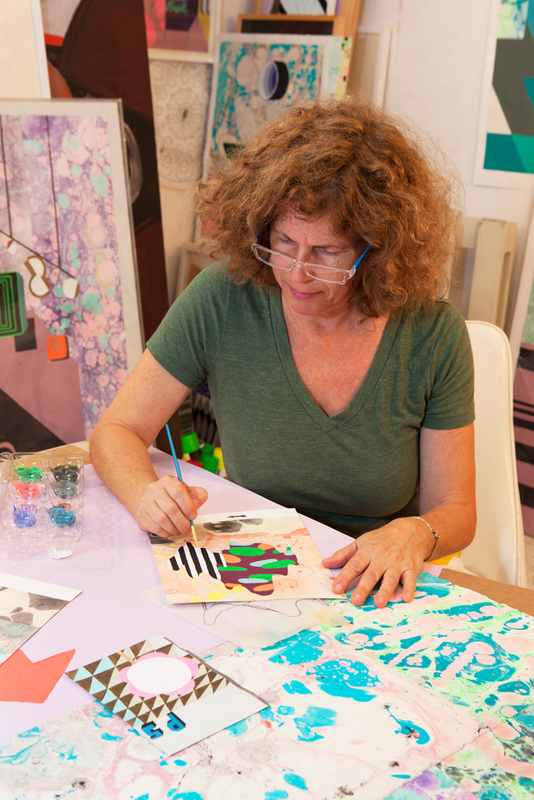 Surrounding herself with colour and joy is instrumental to Michelle’s practice. The artist’s signature stamp. 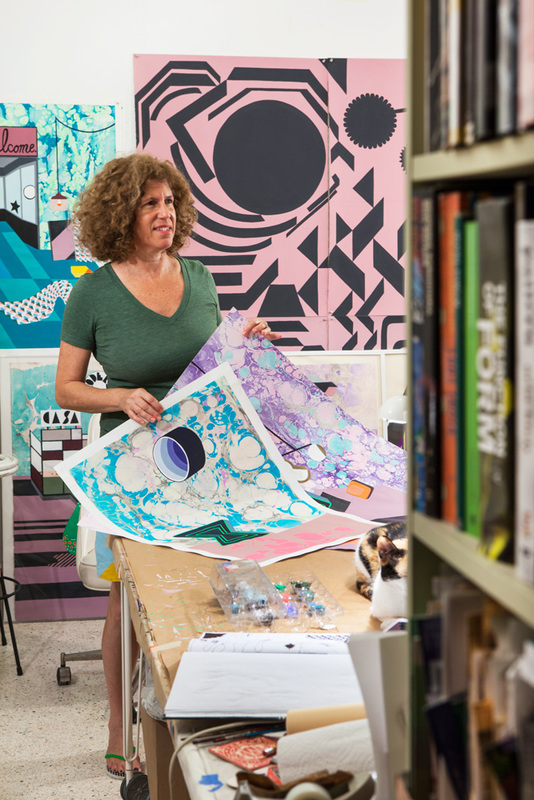 Michelle Weinberg in her Miami studio. TO ENQUIRE ABOUT MICHELLE’S WORK, PLEASE CONTACT US. All photography by Paul Stoppi.